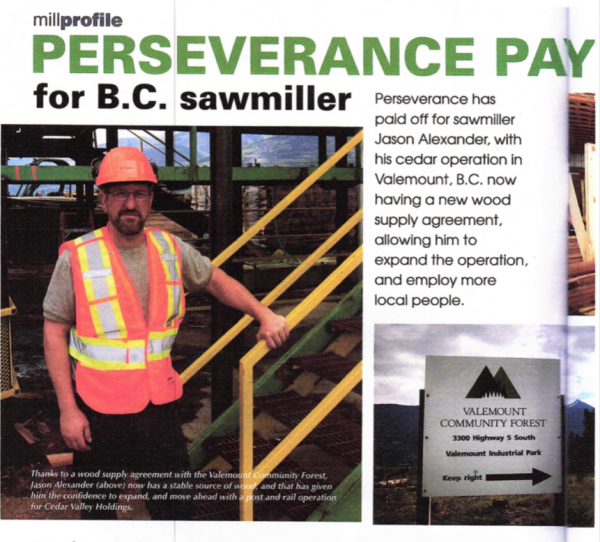 Providing adequate — let alone excellent — health care in rural and remote BC communities, regions, and First Nations presents a set of unique challenges, including vast distances, lack of transportation infrastructure, staffing difficulties, scattered populations, poor or no bandwidth, and a range of socio-economic conditions that impact on health and well-being. 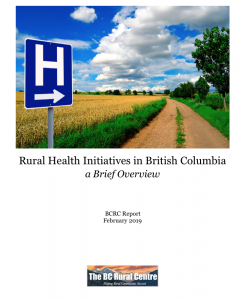 In this brief report, we will showcase a number of initiatives that attempt to tackles some of these challenges, in the process suggesting ways rural BC health care may improve going forward. 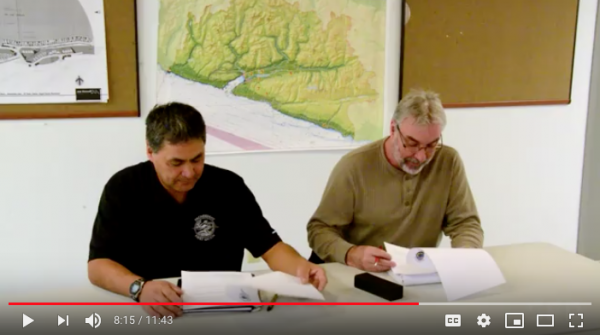 There is little question that telehealth, in its various forms, can make a substantial difference in the quality of healthcare available to residents of rural, remote communities, and First Nations across BC, as these next two videos illustrate. Dr. Terri Aldred is a First Nations physician who overcame personal challenges to come back to her people from the community of Tachet, Lake Babine Nation in Northern BC, to deliver exceptional healthcare using Telehealth. promoting the uptake and use of the evidence into policy and planning discussions in the province. Past issues and priorities that the RER has reviewed include community-led initiatives and strategies for the recruitment and retention of health care providers to rural and remote communities, and the willingness of urban patients to travel to rural areas for elective surgical care. The RER project’s current review explores community participation in health services planning and decision-making via boards of health. To learn about rural citizen and community priorities for health services, the research team developed a survey that is publicly available via the project’s webpage. The anonymous survey – which can be completed in 10 minutes or less – serves as a way for the RER team to communicate with rural B.C. community members about health service issues and priorities. 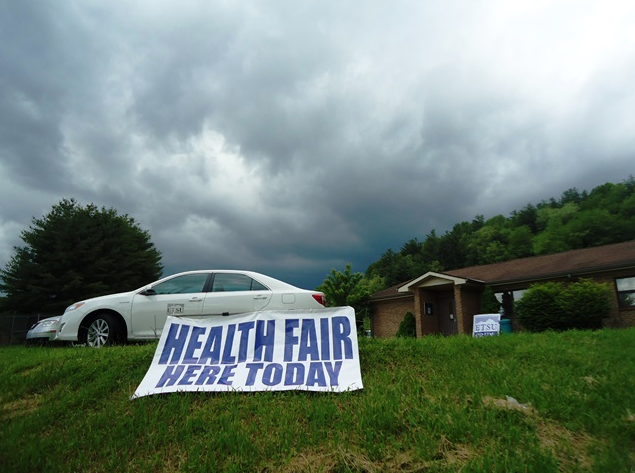 The RER’s goal is to learn from as many rural community members as possible about the health service issues that are most important to them and their communities. The information gathered from the survey responses helps to ensure the project answers the questions that matter the most to rural citizen-patients, and generates evidence that is relevant, appropriate, and useful for rural communities across the province. 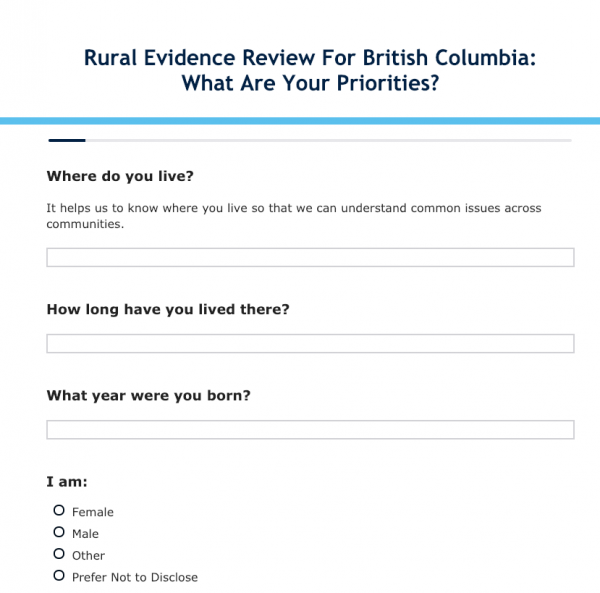 To learn more about the Rural Evidence Review project, or to speak with the Project Coordinator about the health care priorities that matter the most to your rural community, visit the project’s webpage, call 604-827-2193, or email Christine at christine.carthew@ubc.ca. Or, click here to complete the RER’s brief and anonymous survey. The community of Gabriola Island was selected for the Rural Coordination Centre of BC’s 2018 BC Rural Community Award at the BC Rural Health Conference in Nanaimo, BC, on May 12, 2018. 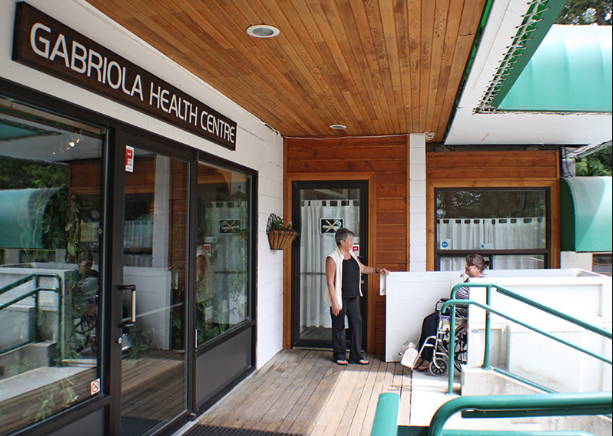 The community was honoured for its innovation and resiliency in recovering from a healthcare crisis in 2006, when one of the island’s physicians – frustrated by a lack of medical facilities and services – nearly left. 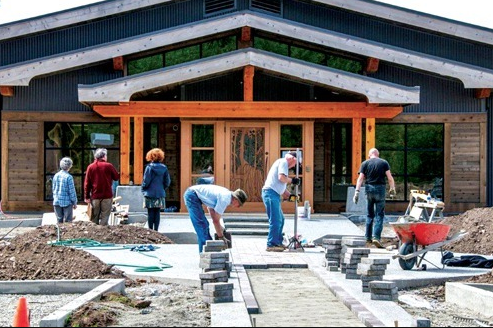 The community addressed the situation by creating the volunteer-led Gabriola Health Care Foundation (GHCF), which organized funding and recruitment of volunteer labour to build a 8,500 sq. ft. health centre. The community health centre opened its doors in 2012. Today, the Community Health Centre provides access to three family doctors, emergency care, a helipad for medical evacuations, a mental health nurse, home care nursing, two social workers (community and seniors outreach), a visiting psychiatrist, surgeon, and plastic surgeon, home support workers, a medical lab, a dental clinic, and telehealth. 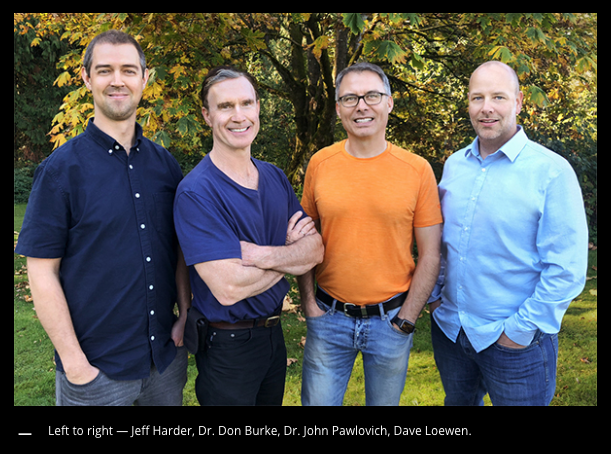 Since the opening of the clinic, the community formed the Gabriola Health and Wellness Collaborative, a dedicated group of volunteers who identify and work to improve social determinants of health. 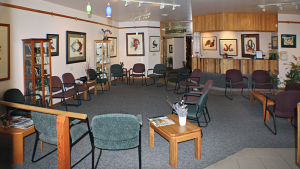 During its first year, the Collaborative focused on the mental health and substance use issues and partnered with the Canadian Mental Health Association and University of Victoria to train dozens of community members in Cognitive Behaviour Therapy. In 2018, the Collaborative will address supports for child poverty and hospice services. 2018 marks the fifth year that RCCbc has recognized BC physicians and communities for their contribution and dedication to rural medical practice with the BC Rural Health Awards (formerly the Awards of Excellence in Rural Medicine). Each year, RCCbc recognizes rural physicians within a themed category (e.g., Rural Opinion Leaders in 2015, Outstanding Mentors in 2014) as well as acknowledging long-term practitioners who have shaped and served their communities for more than 15 years. In 2016, RCCbc began to honour the valuable work of inter-professional health care teams in sustaining and/or retaining rural community health services in British Columbia. Recipients were selected by a committee consisting of representatives from RCCbc and the University of British Columbia. All award recipients receive a plaque, along with a $2,500 grant to be used for hosting a community celebration. The BC Rural Health Awards are made possible through the generous funding provided by the Joint Standing Committee on Rural Issues (JSC). 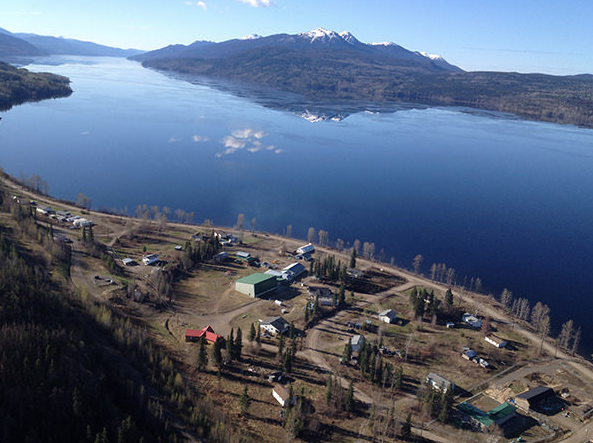 The Rural Coordination Centre of BC works to enhance rural education in British Columbia and advocates to improve the health of rural BC residents. 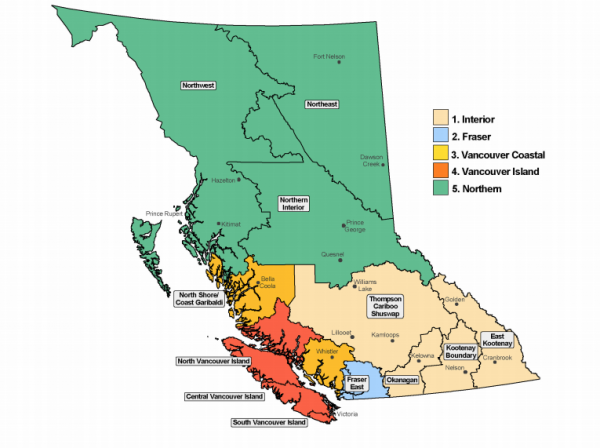 Working at the direction of the JSC, and in collaboration BC’s health authorities, post-secondary institutions, practitioners, and rural communities, RCCbc identifies gaps and overlaps in rural services throughout the province and creates initiatives to address shortfalls. It works to increase and sustain recruitment and retention of rural healthcare professionals to BC and to provide high quality, in-community healthcare to rural British Columbians. The Joint Standing Committee on Rural Issues is a BC-based entity that includes representation from the Doctors of BC, the Ministry of Health, and health authorities. The JSC advises the BC Government and the Doctors of BC on matters pertaining to rural medical practice and develops programs and policies for BC’s rural physicians. 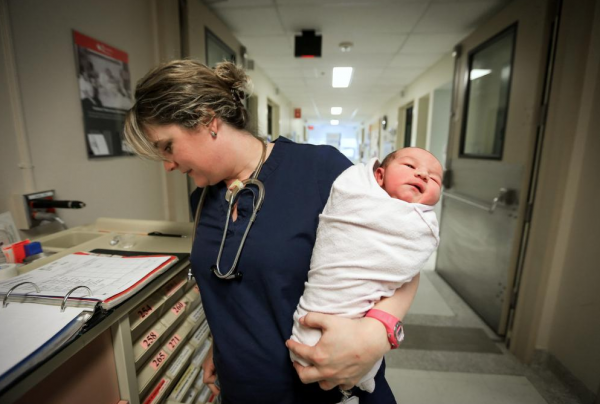 The Rural Obstetrics Network is being established to support rural BC maternity care providers (GPs, specialists, midwives, nurses) in their pursuit of providing sustainable and rewarding obstetrical care within their rural communities. The program’s mission is to develop and maintain a collaborative community, whose purpose is to support rural maternity care providers (GPs, specialists, midwives, nurses) in their pursuit of providing sustainable and rewarding obstetrical care within their rural communities. Develop a mechanism for open, proactive and responsive communication while providing a voice to rural obstetrical care providers to decision-making bodies. 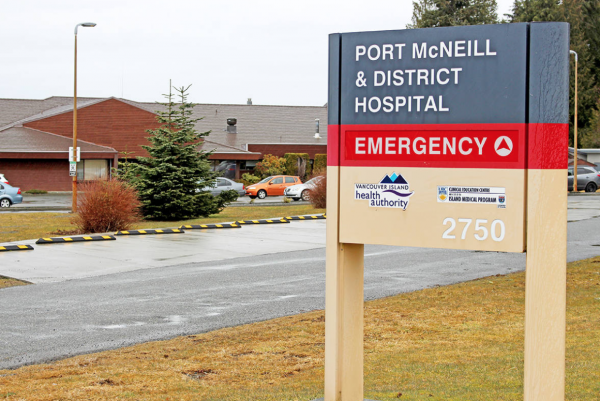 The North Island Project began with the goal of creating a patient Decision Aid to help women decide where they should give birth (in Port McNeill’s hospital or down island). After spending time in the community speaking with women and other community members, it became clear that local healthcare providers needed supportif they were to continue to provide services. Area women gave voice to the challenges they face in having to leave the community to give birth. It is often difficult to arrange transportation, and it becomes challenging to travel if there are other children in the family. For many families, it is too expensive for partners or other family members to travel down island with them, and the whole travel experience can make women feel very anxious. Leaving the community also means women and families have to find a place to stay to wait until they go into labour, and again for a few days after they have had their baby. This can be difficult as women do not know how long they will need to be out of their community. 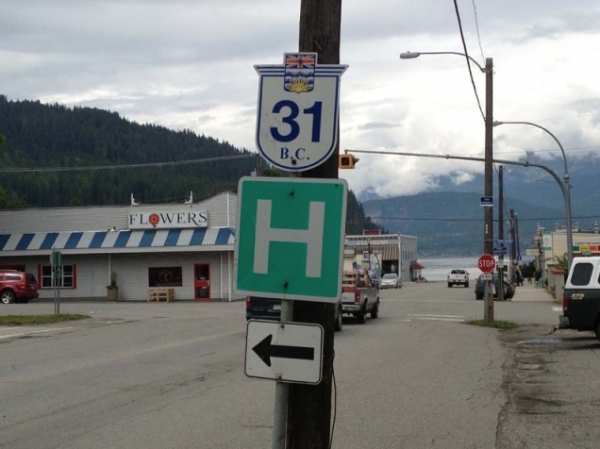 Adverse outcomes are common results of closures or downgrading of rural health services, as evidenced in BC, elsewhere in Canada, and internationally. The loss of local maternity services and subsequent need for women and families to travel for care has resulted in poorer maternal-newborn health outcomes, and a number of social challenges associated with leaving the community and dissociation from family ties and larger community social supports. Women often have to leave home several weeks before their babies are due, and are away from home for a substantial period of time while they wait to have their babies. A gap currently exists between system imperatives of birth ‘closer to home’ and health service supports that enable such care. How best to support small rural maternity services, enabling them to provide excellent, high-quality and sustainable maternity care, as an open question. 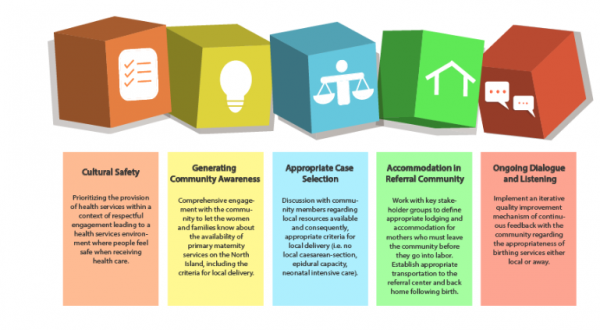 One that had led to a North Island feasibility analysis for each of the Building Blocks for Sustainable Maternity Care (depicted below), in order to further understand how to best support rural maternity care in remote Vancouver Island communities, and across rural British Columbia. Dr. Granger Avery, past president of both the Canadian and BC Medical Associations, is a long-time Port McNeill-based physician. The plan is to engage in a feedback loop at every phase in the data gathering process, involving both the local community and the local and referral care provider team to ensure community values and best clinical practices are appropriately captured and summarized. All while continuing an intensive engagement with communities, including First Nations, other key community stakeholders, administrators, and care providers to reflect community priorities. 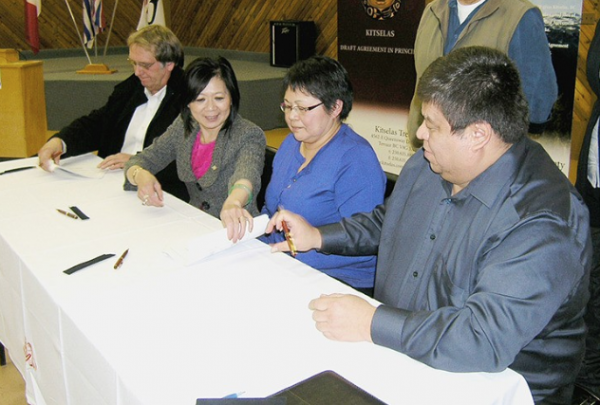 The First Nations Health Authority (FNHA) is the first province-wide health authority of its kind in Canada. In 2013, the FNHA assumed the programs, services, and responsibilities formerly handled by Health Canada’s First Nations Inuit Health Branch – Pacific Region. 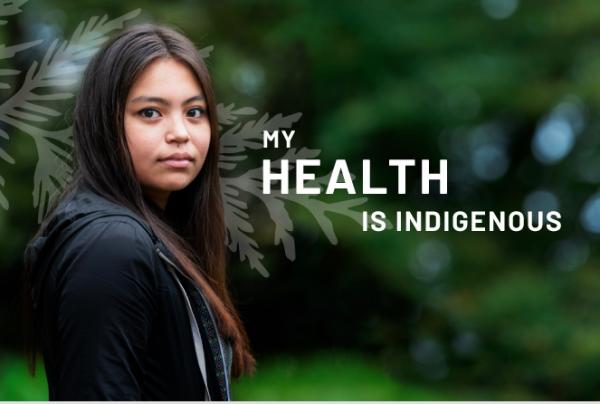 FNHA’s vision is to transform the health and well-being of BC’s First Nations and Aboriginal people by dramatically changing healthcare for the better. The FNHA is responsible for planning, management, service delivery, and funding of health programs, in partnership with First Nations communities in BC. Guided by the vision of embedding cultural safety and humility into health service delivery, the FNHA ​works to reform the way healthcare is delivered to BC First Nations, through direct services, provincial partnership collaboration, and health systems innovation. The First Nations Health Authority is part of a unique health governance structure that includes political representation and advocacy through the First Nations Health Council, and technical support and capacity development through the First Nations Health Directors Association. Collectively, this First Nations health governing structure works in partnership with BC First Nations to achieve a shared vision. FNHA’s work does not replace the role or services of the Ministry of Health and Regional Health Authorities. The First Nations Health Authority is designed to collaborate, coordinate, and integrate respective health programs and services to achieve better health outcomes for BC First Nations. 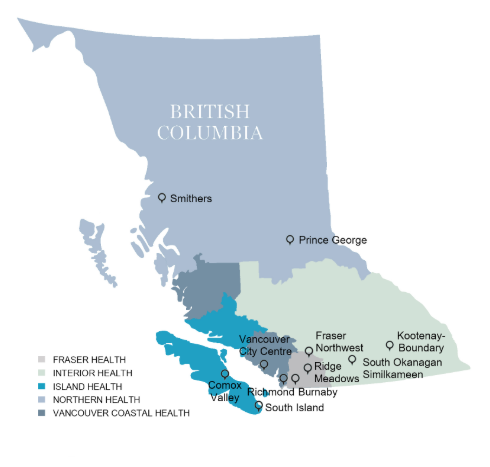 Across BC, divisions of family practice and health authority and community partners are working to establish primary care networks (PCNs). A PCN is a clinical network of local primary care service providers located in a geographical area, with patient medical homes(PMHs) as the foundation. A PCN is enabled by a partnership between divisions of family practice and health authorities. Collectively increase a community’s capacity to provide greater access to primary care for people without a primary care provider. 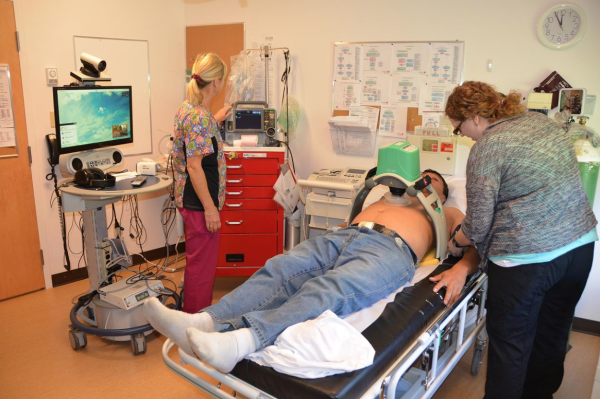 Access expanded services for vulnerable patients and those with complex health conditions. As optimized family practices, PMHs are at the core of the PCN. A patient medical home (PMH) represents the work in the doctor’s office, while the PCN represents system change in the community. A PCN is is governed and supported by the division-health authority partnership with additional support from community partners, through the local Collaborative Services Committee (CSC) or in some cases, a division’s PCN Steering Committee. Decisions about the local PCN are made collectively by the local CSC partners and are informed by the participants, including physicians. Working with their division, GPs are integral in designing and influencing how local PCNs are designed to support patients. Physician leadership and division participation is essential to establish PMHs and PCNs as the foundation of an integrated system of care. Across the province, CSCs are exploring opportunities to establish and support primary care networks, building on other successful local initiatives. When CSC partners are ready to formally engage in designing a local PCN or PCNs for their local community (or communities), they complete an Expression of Interest (EOI), indicating their readiness to participate. Once the EOI is reviewed and approved, the CSC is provided with $150,000 change management funding and other supports to complete a Service Plan developed for their local needs. The CSC is encouraged to focus their first phase of service planning on ensuring patients who do not have a primary care provider are attached to one. Once the attachment gap is narrowed, the focus is on redesigning local services and adding resources to optimize the team-based care approach. Following approval of the Service Plan, CSCs are provided with funding to begin implementation. While the challenges in providing a high standard of healthcare to all British Columbians are many, there are many initiatives current underway — from CODI to the FNHA to PCNs — that hold tremendous promise. To the extent these and other initiatives are to be successful, it is essential the public is as well informed as possible. The common thread between every project covered in this report is the crucial role communities — rural and First Nations citizens — must play in project deployment, if desired outcomes, chief among them enhanced healthcare outcomes for rural British Columbians, are to be realized. Health Care, Rural Services doctors, Doctors of BC, First Nations Health Authority, FNHA, health, Joint Standing Committee on Rural Issues, RCCbc, Rural Coordination Centre of BC, rural health, rural health innovation, rural helthcare, rural medicine, telehealth, UBC. permalink.